That was the one constant question in my marriage. Not “How was your day?” or “What would you like to do tonight?” or “How are you feeling?” Instead of checking in with one another emotionally, we checked out together by watching TV. Between our jobs and parenting, it often felt like a chore to make the effort to reconnect with my husband at the end of an arduous day. For a long time one of us would make dinner while the other one worked, and then for our “bonding time” we would sit and watch a TV show together while we ate. We were always up to date on Game of Thrones, but not so much attuned to what was happening in each other’s lives. Even though it didn’t feel like a relationship roadblock, it was, because we were never truly present with one another when we were engrossed in watching a show. While this shared experience is one many couples opt for, it isn’t exactly a great way to connect Even though you may want to zone out and watch TV together because you’re tired, studies suggest that decreasing screen time can actually help your exhaustion. When we eventually decided to ban the TV during dinner, we found more creative ways to connect, and it improved our relationship. 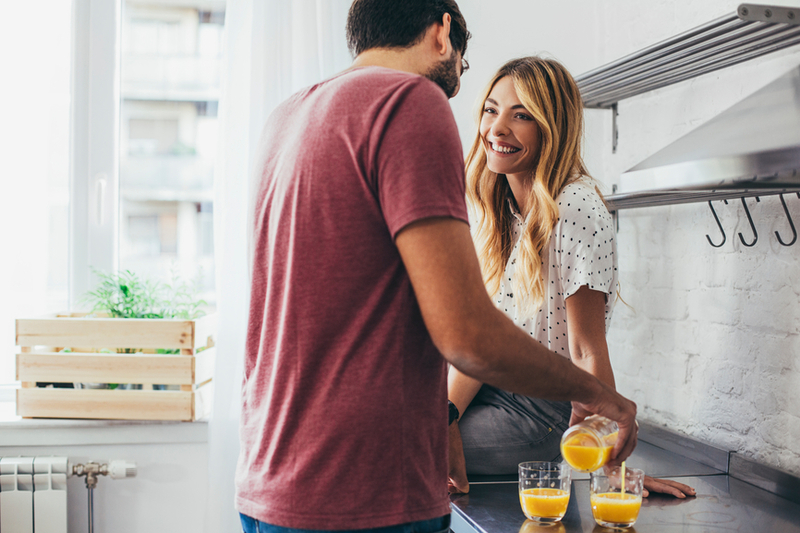 If you’re looking for a better way to connect with your significant other, try these TV alternatives to end the day on a high note of intimacy. Making dinner was a mutual, and intimate, activity when my husband and I first moved in together. Somewhere along the line, it became a chore that one of us did while the other was nowhere to be found. But there’s something inherently romantic and intimate about cooking together. It’s an exercise in communication as we read off recipe steps and delegate prep work to one another. We’re dancing around each other as we share the kitchen, adjusting food to each other’s tastes. Not to mention we are far more likely to consciously enjoy our meal when we’ve put in the effort together, instead of mindlessly eating in front of the TV. Some nights, I still don’t have the mental and physical energy to do something with my husband, but I can relax on the couch and listen to something. An easy way to replace the lull of the TV while remaining more present with one another is to switch over to podcasts. It took us a little while to find something we agreed on. He didn’t want to listen to my financial or writing podcasts, and I wasn’t into his serial killer radio show. Now we listen to storytelling podcasts like The Moth or my personal favorite, Mortified. We still get the story fix we’re looking for with TV, but with a lot more eye contact, connection, and laughter. I have a thing for bullet journaling and baking, which my husband doesn’t understand at all. He has a thing for woodworking and building bicycles, which is way out of my wheelhouse. We often don’t take enough time doing these things that bring us joy, because they separate us. We had such precious little time together that doing our own hobbies never landed on the schedule. However, we’ve found that doing separate crafts and hobbies side-by-side is oddly satisfying. We’re both engrossed in our own area of expertise, and it’s nice to see one another doing work that brings us satisfaction. When we were first dating, we spent so much time dreaming up big plans for the future. We talked about the places we would go and the adventures on our bucket lists and everything we wanted out of life. Many years later, after marriage and three kids and a whole slew of other milestones, we realized that plans don’t often turn out the way we think they will. However, it’s still a lot of fun to look toward the future with reckless optimism and talk about all the things we still want to accomplish together. Settling in on the couch for some brainstorming and dreaming is ultimately more rewarding than zoning out for another Netflix binge session.